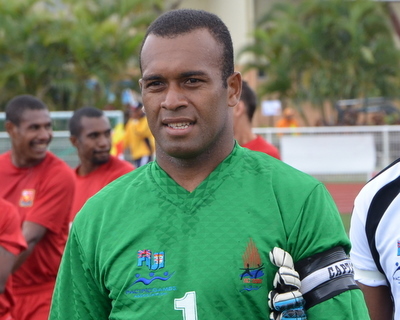 Tamanisau led his country through pool play unbeaten – the sole captain in the 11-nation tournament to do so – and it looked like the Fijians were on course for a place in the final as they held a 1-0 advantage with just over ten minutes to go in their semi-final against Solomon Islands. A Maciu Dunadamu strike had earned the lead in the 69th minute but it was wiped out just eight minutes later when goalkeeper Tamanisau raced from his line to gather a loose ball but Solomon Islands player Joses Nawo beat him to it and rolled home into an empty net. That inspired a Solomon comeback and the Bonitos went on to win the match in extra time with a Henry Fa’arodo penalty. Fiji then failed to redeem themselves in the 3rd/4th play-off match that followed, being denied bronze by Tahiti in a 2-1 defeat. Tamanisau admits plenty of mistakes were made across those matches and is first to put his hand up. But rather than dwell on the past, he is keen to use the experiences to improve his own game and that of the team. “I want to tell the fans not to expect the same in the next international match,” he says. All of Fiji’s matches were played on artificial turf in New Caledonia and, while the venues were in perfect condition, Tamanisau says the unfamiliarity of the surface may have had something to do with his semi-final slip up. “It was hard to judge the speed of the ball,” he says. “I thought I was going to get to it but, as it came nearer, it went slower and just stayed ahead of me. I must say that cost us the game. The Fiji cause was also not helped by the abscence of star striker Roy Krishna, who received a straight red card in the win over Cook Islands and was therefore suspended for the last pool match – a 2-0 win over Papua New Guinea – and the all-important semi-final showdown on the island of Lifou. But Tamanisau says a lack of preparation was the real reason behind Fiji’s failure to finish in the top three. He says this must be put right in the national side’s next outing, the OFC Nations Cup. The event is set to be held in Fiji in June and is a key part of the qualification process for the 2014 FIFA World Cup Brazil. Eight countries – namely Fiji, New Caledonia, New Zealand, Papua New Guinea, Solomon Islands, Tahiti, Vanuatu and the winner of the first stage of qualifying – will take part in a tournament based on a league system with semi-finals and a final. The winner will go on to represent OFC in the 2013 FIFA Confederations Cup. The four highest-placed teams from the second stage will then contest stage three – a round-robin, home-and-away play-off series. The matches are foreseen to take place between 7 September 2012 and 26 March 2013 in FIFA windows. “I think that if we want to qualify for the third stage then we have to start preparing early,” Tamanisau says.